You’re happy your parents want to age at home. You’ve taken precautions inside. They have grab bars now. There are sturdy rails and non-slip rugs on the wood floors. What about outside? 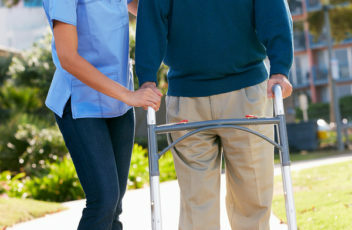 According to the Fall Prevention Center of Excellence, 23 percent of falls happen in the yard. It’s not just the falls that put seniors at risk outside. Fires started by grills or fire pits and attacks by animals and insects are also dangers. Outside safety is just as important as indoor safety. To keep hornets and bees from building homes under a deck or porch, staple pet-proof screening around all open sides of a deck or porch. For a decorative touch, you can nail lattice over the screen. It will keep insects and animals out. Keep an eye on the patio tiles and decking. If a deck board is rotting or warped, it could pose a safety issue. Pull it out and replace it. If multiple boards are rotting, it might be time to replace the deck. Patio tiles may raise out of place as the foundation settles or is shifted by frozen ground in the winter. If that happens, level tiles that are sunken or raised higher than the rest. Keep branches on trees and shrubs trimmed and away from the house. You don’t want a branch to break a window on a windy day. Trees against the foundation can cause problems as the roots grow and push against basement walls. If there are dead trees, they could topple and put your parents’ safety at risk. They also draw carpenter ants, so you want them taken care of before they target and damage wood framing in and around your parents’ house. 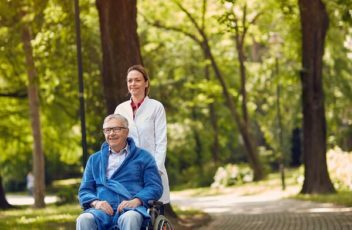 Mobility issues can make it hard to go outside. If your parent has a sloped or an uneven yard, create safe walking areas. A stone walkway or patio with raised garden beds surrounding it will provide opportunities to be outside in the fresh air. Benches along a path or on a patio provide a place to rest. When your mom and dad spend time outside, you can hire elderly care services to offer a level of supervision. Caregivers can walk with your parents. They can lend an arm for balance. They can make sure your parents put on sunscreen, wear a hat, and avoid heat exhaustion. 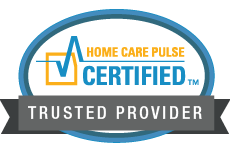 Call an elderly care agency to learn more.